Mimaki Engineering Co., Ltd., a global industry leader and manufacturer of wide-format inkjet printers and cutting plotters, announced today that it will launch the inkjet textile printer Tx300P-1800 in December 2015. The 1.8-m-wide roll-to-roll direct textile inkjet printer Tx300P-1800 is the successor to the Tx2-1600, which has been used for the last 14 years worldwide. This new printer product mainly targets designers or students who wish to instantly create designs for a sample or small-lot production. In recent years, textile industry printing systems have been changing from conventional analog printing to plateless digital printing to meet market demand for high-mix low-volume print production capabilities and quick delivery. Accordingly, production settings are changing from remote areas to city areas closer to consumers. This trend is expected to accelerate over the next few years, with consumers being able to order their favorite designs via the internet with the ultimate capability of being able to reprint items as much as they require. Mimaki predicts that consumers will begin to regularly create custom designs once they have grown weary of ordinary design options in the marketplace. To accommodate such ultimate order-made printing, Mimaki will offer solutions to realize diverse printing needs. Printer head gaps should be finely adjusted according to textile types, with a high head gap setting being needed to avoid contact with raised surface fibers. However, unskillful head adjustments or excessively high head gap settings degrade the accuracy of ink droplet placement, with associated print quality being affected. The new Tx300P-1800 employs a new printhead that ejects ink droplets at high speed to ensure accurate ink droplet placement with a high head gap, thereby providing high-quality printing results. Also, a stable textile transportation mechanism applies uniform tension on textiles to ensure stable printing at high-speed modes. Moreover, beautiful print results are achieved via the use of innovative inkjet technologies, and the print speed of the Tx300P-1800 is more than twice as fast as that of a conventional printer. *1 Sublimation dye, disperse dye, pigment, reactive dye, and acid dye inks*2 are provided to meet a wide range of customer application needs. The entry-level direct textile inkjet printer “Tx300P-1800” consistently achieves high-quality direct printing via use of reliable machinery, printing processes, and ink techniques. 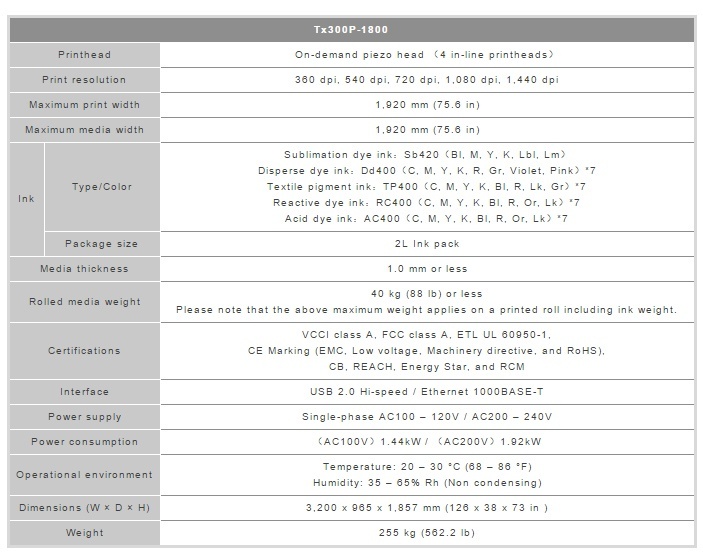 *1: Print speed is compared with DS-1800. Sb420 ink is used for measuring the speed of the Tx300P-1800. *2: The following inks are available in the future: disperse dye, pigment, reactive dye, and acid dye. Waveform control technique ensures beautiful print results. Nozzle Check Unit (NCU) automatically detects and cleans clogged nozzles. Nozzle Recovery System (NRS) uses only good nozzles as substitutes, when the clogged nozzles are not recovered after cleaning. 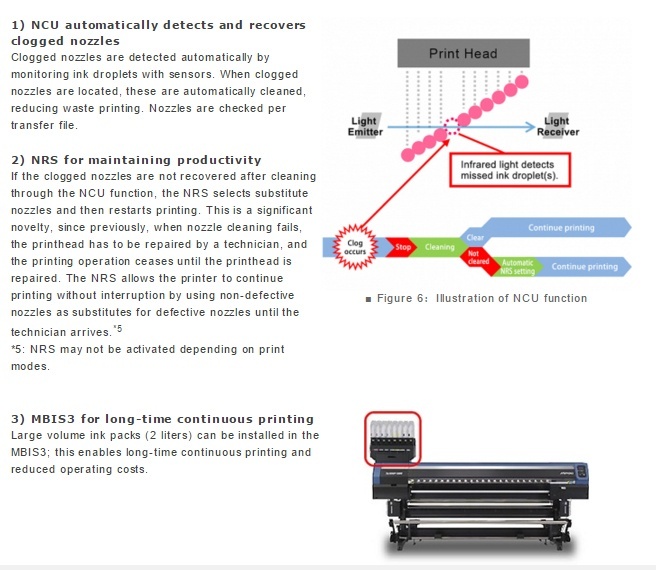 These functions ensure constant printing performance and reduce printing waste due to defective nozzles. The standard-feature MBIS3 can utilize large volume ink packs (2 liters) for long-time continuous printing. The TxLink3 Lite offers simple RGB and CMYK color replacement on raster and vector data, as well as the ability to produce different color patterns. Various color replacement functions can represent desired colors. Stable textile feeding and transportation is crucial for direct textile printing. 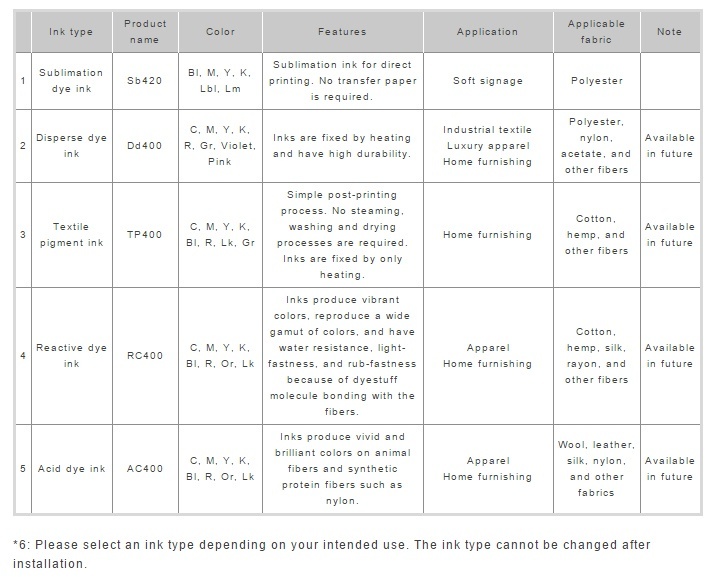 Uniform tension is applied to a subject textile during a given printing job but can individually vary depending on the specific type of textile used, as well as due to other factors including feed/take-up roll outer diameter changes, ink usage amounts, and textile paths. 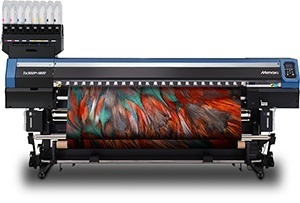 Tx300P-1800 achieves stable textile transportation while maintaining an optimum tension owing to Mimaki’s unique and reliable techniques that are based on years of textile inkjet printer research and development. Each ink color has its own specific gravity and viscosity. To achieve precise placement of the ink droplets onto the media, Mimaki designed an optimum waveform that allows the printhead to jet each ink color at the appropriate jetting angle without losing excellent ink droplet circularity even at the high head gap. 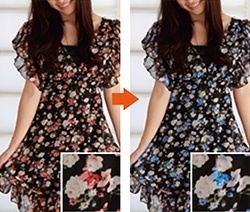 Moreover, various ink droplet sizes are precisely placed from the minimum size 6pl to the maximum size 24pl. *4 Small droplets create beautiful high-resolution printing, and large droplets are very useful for high-speed printing. Thus, the Tx300P-1800 satisfies a wide range of needs including beautiful high-quality printing and productive high-speed printing. *4: Minimum and maximum droplet sizes of Sb420 ink. Droplet sizes vary depending on each ink type. Generally, swath boundaries are straight lines. Therefore, a slight misalignment between boundaries causes banding or uneven color printing. MAPS4 reduces banding and uneven color printing with blurred boundaries similar to gradation printing. Ink and media shortage, clogged nozzles, and other minor problems influence stable productivity. The Tx300P-1800 fully supports continuous printing with reliable technologies. Desired colors can be represented by specifying the ink volume of each ink color. When the printed color differs from that expected, the color replacement function enables a user to specify the desired printing color as the target color. This function is useful for reproducing corporate colors. With the TxLink3 Lite, colors are easily replaced on vector and raster data. 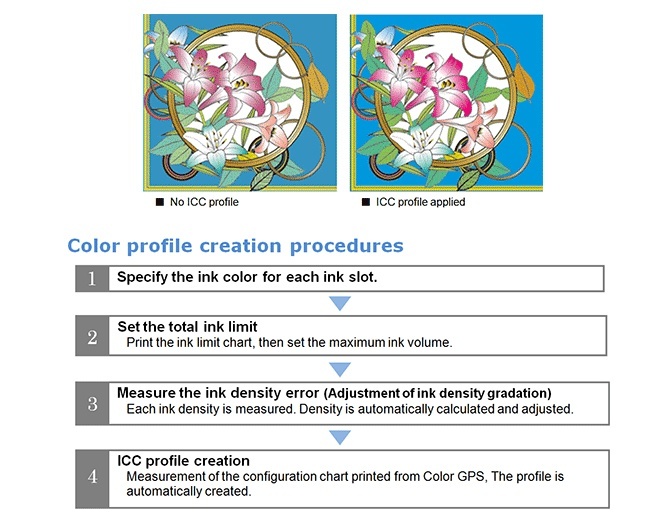 ICC profiles can be created simply to match a target color by following the wizard.